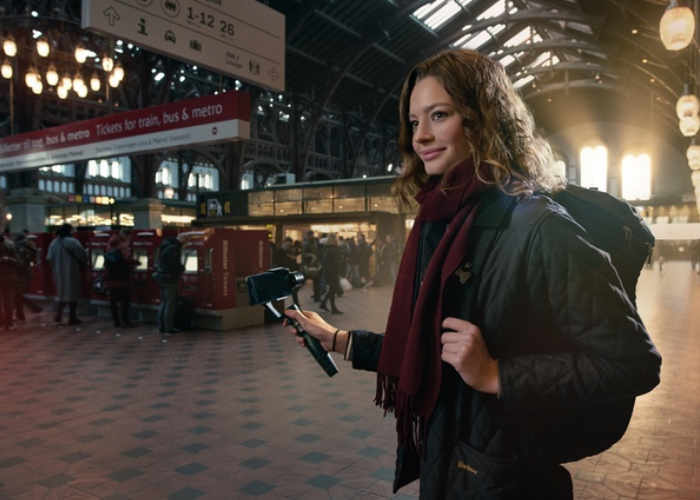 Smartphone photographers and especially videographers that are looking for an affordable way to capture smooth video footage, may be interested in the FlowMotion ONE smartphone handheld gimbal. Designed to enable you to capture smooth cinematic videos specifically using your smartphone, the FlowMotion ONE includes features such as auto-follow tracking, motion time-lapse photography and more. Watch the demonstration video below to learn more about the FlowMotion ONE which has already raised over $100,000 thanks to over 530 backers with still 47 days remaining on its Kickstarter campaign. The development team behind the smartphone handheld gimbal explain a little more about its inspiration, design and functionality. FlowMotion ONE – Capture smooth cinematic videos with your smartphone. Auto-follow tracking, motion time-lapse, and so much more. It’s hard to capture smooth video with your smartphone, we’ve all been there. You think you captured the perfect moment, but it ends up as a crappy memory. We’re FlowMotion and as adventurers, travelers and techies, we believe that great moments should be captured in the best possible way. That’s why we made FlowMotion™ ONE – the world’s most versatile smartphone stabilizer. Is it designed just for protection of videographers? Absolutely not! Our mission is to put an end to shaky videos and make professional videography available for everyone. FlowMotion™ ONE is developed by engineers, designers and professonal videographers, made for everyone to capture everyday moments. Jump over to Kickstarter for more details and a full list of all the earlybird pledges available with shipping expected to take place during April 2017 if all goes well.